The press had a field day with the triumphant reunion of long separated brothers (and former bandmates) Max & Igor Cavalera in Cavalera Conspiracy, their new project featuring Joe Duplantier of Gojira and Marc Rizzo of Soulfly. It’s perfectly understandishable: Sepultura post-Max (with the possible exception of Dante XXI) & Soulfly never quite lived up to the previous greatness of Sepultura, but CC seems to be their bid to take back that legacy. A big step in that direction is their return to the stage, which has been announced in the form of a few select East Coast dates (so far) with The Dillinger Escape Plan (yay! ), Throwdown (meh! ), Bury Your Dead (BOOOO! ), and Incite. NYC gets two nights in a row at The Fillmore East @ Irving Plaza, July 19th and July 20th. Ticket info forthcoming. 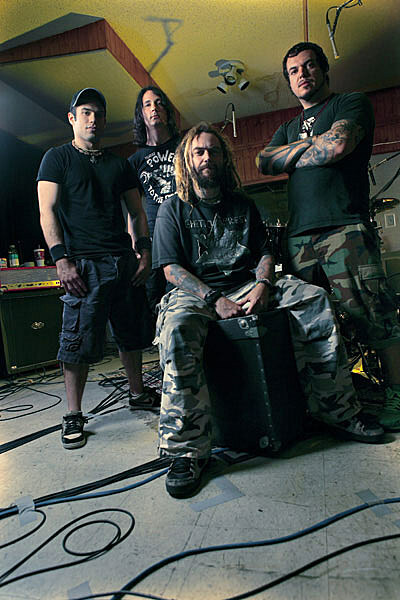 Max Cavalera has also announced that a new Soulfly album called Conquer is on the way. It’s scheduled to hit the streets on July 29th. Igor Cavalera says he “is not interested” in a Sepultura reunion. Sepultura, or what’s left of ’em anyway, are working on a new album based on Anthony Burgess‘s classic novel “A Clockwork Orange”.